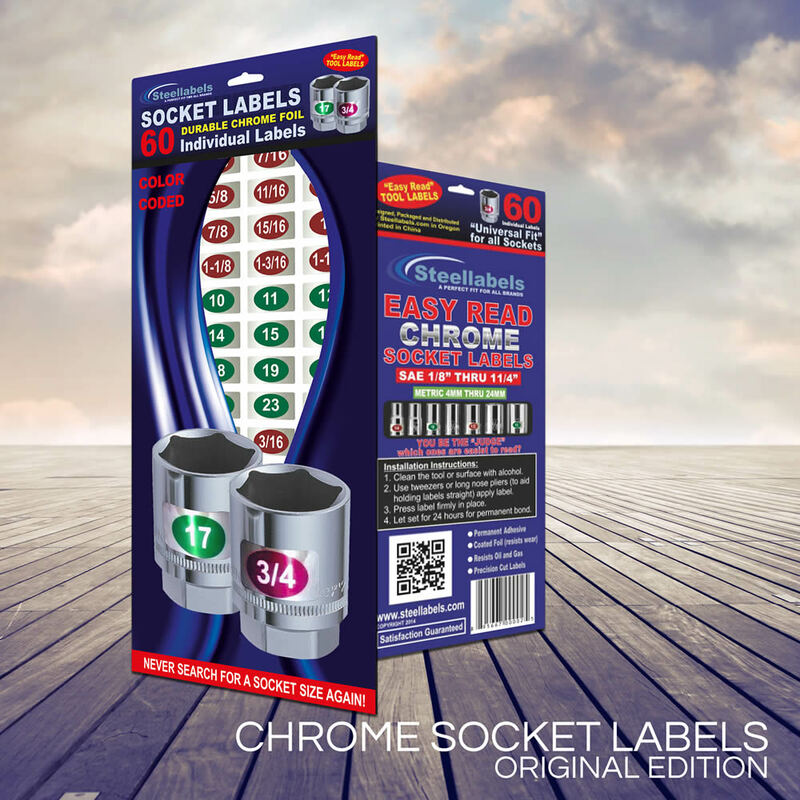 “Eye Saver” socket set decals, tough chrome foil labels for sockets and tool identification. Great for mechanics and craftsman. 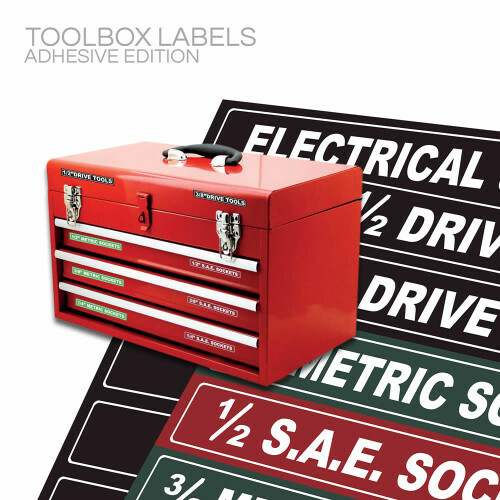 These stickers fit all fine Snap On, Craftsman, Mac, Matco, and Cromwell tools. Best quality at the best prices. 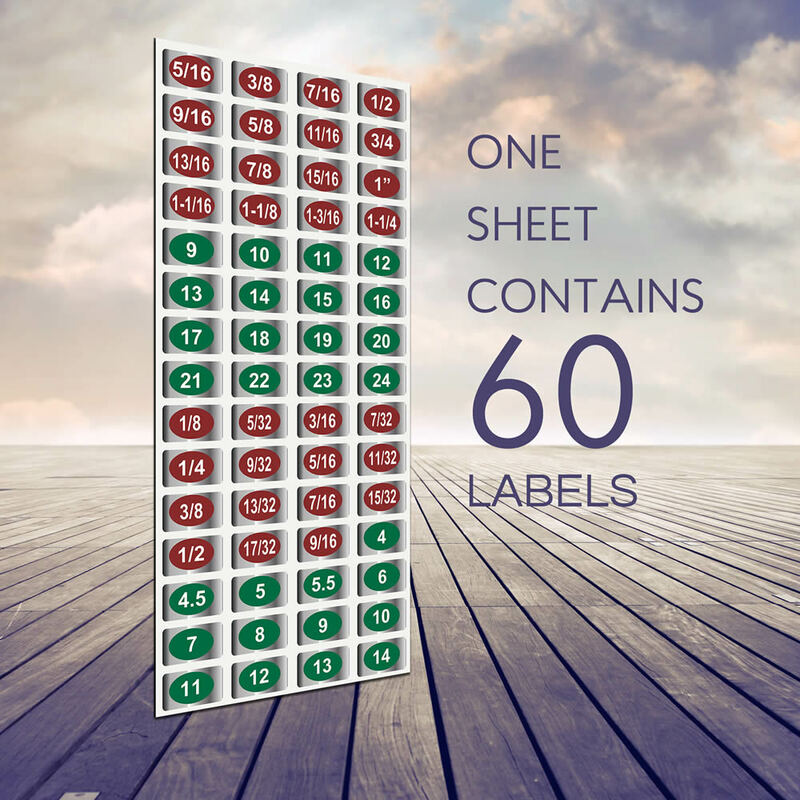 Our Best Selling Label Set! 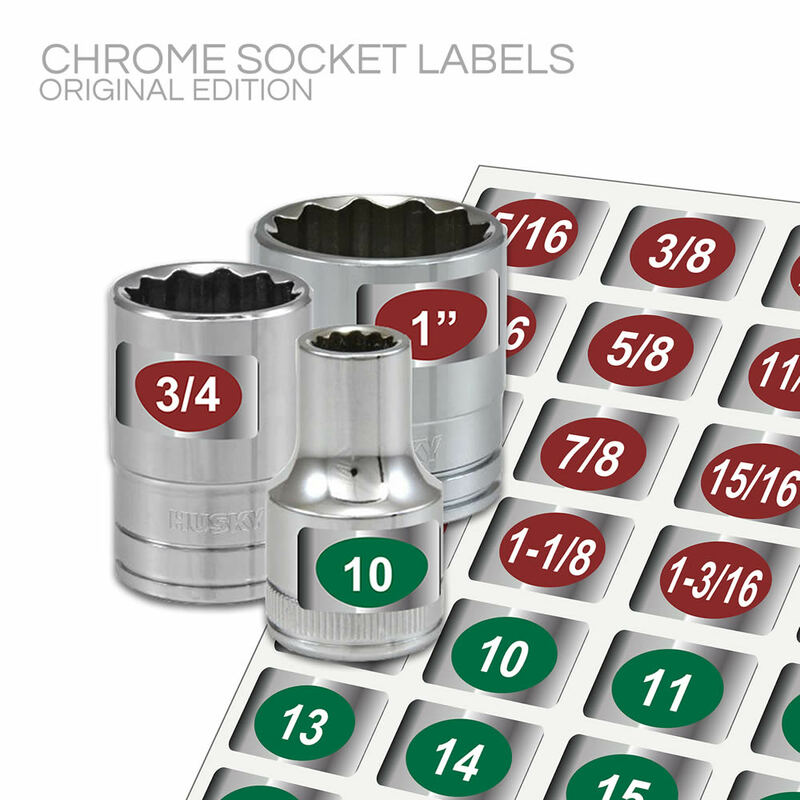 Label your sockets, socket rails, nut drivers, and wrenches for “easy read” and quick organizing. See how easy it will be to find those pesky 1/4″ drive sockets. Look at the photos and “you be the judge”. 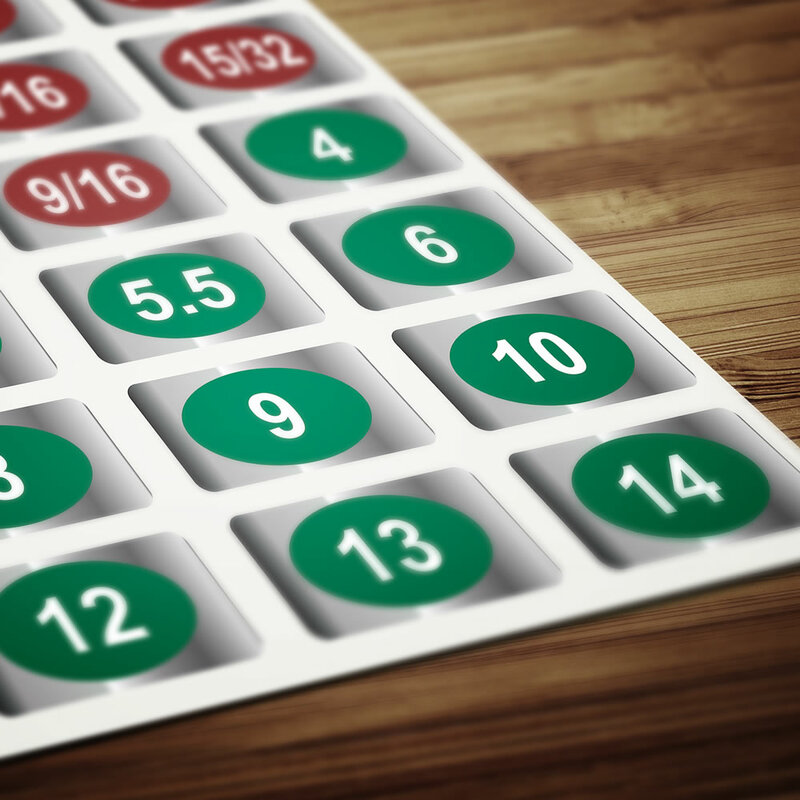 Will your sockets be easier to read and organize? We think so. These make a great gift. 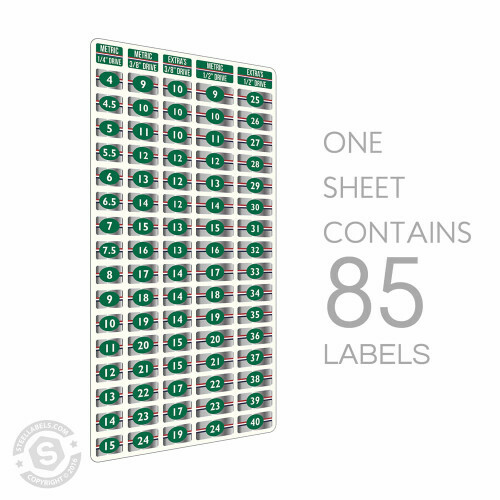 Labels are fabricated with a tough, 4 layer composite process which includes an adhesive backing, precision cut, tough, foil material, high visibility white lettering, and clear coating to help resist wear. Red &Green with Bright White Letters and Chrome Background. Install at room temperature – Clean Sockets with Alcohol only (let all vapors dry off) – press label firmly in place – let set for 24 hours. I can now easily see the size of the socket! Trying to figure out what size the socket is can be very difficult. Trying to distinguish silver writing on silver sockets is nearly impossible, especially in low light conditions (ie. in the shed or under the car). Having labels that are easy to read, color coded for wrench size is awesome. I have so many sockets…I carry them all in a couple of toolbags. 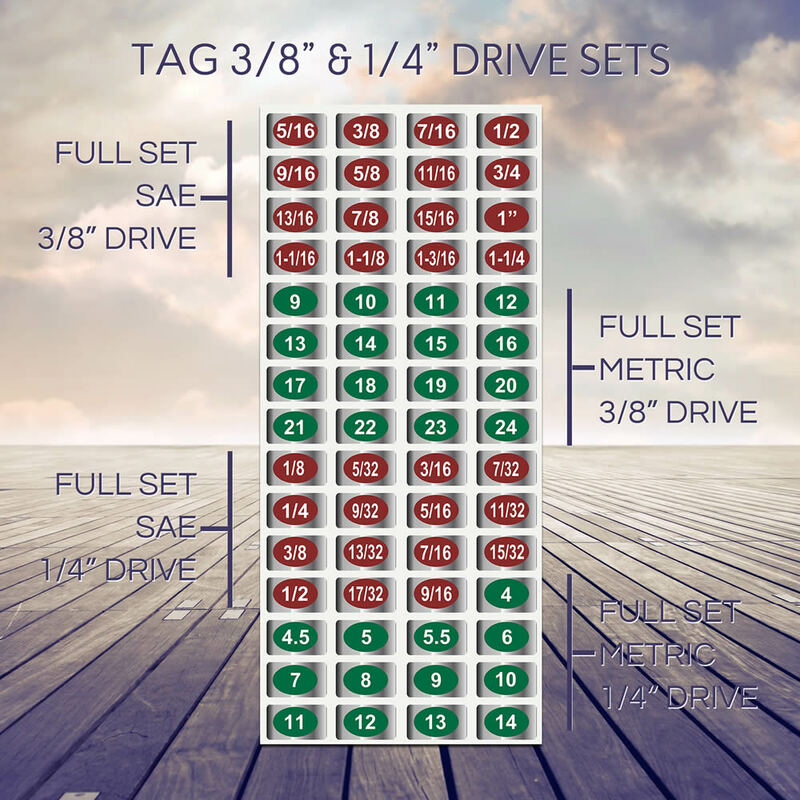 I really like that the metric and SAE are different colors. I bought 4 strips of these labels. You do need to clean the sockets with alcohol before adding the label. I wish there was a different mix of the number of the most common sizes. I still have some stickers on sheet 1 but have used the sizes of all 4 sheets for the most common sizes like 1/2 and 9/16. I never was good at looking at a socket and knowing its size without looking at the markings. These have made my socket bags better organized. Everything was exactly as advertised. I couldn’t ask for more! I received this product in the time specified. The stickers were on a slip of paper in a resealable plastic sleeve. This was mailed in a envelope. The package was easy to open and the stickers were easy to remove. The instructions are printed on the reverse side of the sticker sheet. The stickers removed easily from the paper with no troubles. I used my fingers to apply most of the stickers and even the parts that touched my fingers stuck very well. After the recommended 24 hour period the stickers held fast. Being that they are stickers, there is a slightly raised edge, but otherwise they fit smoothly all the way to the edge of the stickers. They seem to be held tight and fell able to withstand the rough conditions the tools may be subjected to. The chrome backing color nearly perfectly matches my sockets. The white text on the colored circles makes it easy to read even in dark conditions. Additionally, the colors make it easy to immediately determine if the socket is metric or imperial. These are awesome! Everything fits nice and tight. Now days sockets come with the sizes already pre-etched on them but if you are like me and are getting up in years and your eyesight is not what it use to be AND you have an old set of sockets that you do not want to replace with the new fancy easy reading sockets then this might be the solution for you. Beware this is not a cheap alternative. 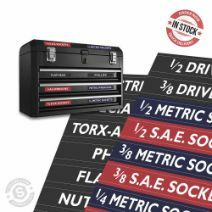 Just to do my 3/8 in drive sockets it took me 6 sets of labels and at $3.50 a pop, well you do the math. The product arrived promptly and after reading the directions I cleaned my sockets with rubbing alcohol, let dry and then peeled and placed the labels. They recommend not to use them for 24hrs so adhesion is maximized. These labels are foil like with a pretty sticky backing and it appears they will stay on for some time but I have not time tested them. I recommend buying an extra set to replace the ones that become too tattered with use. Overall I am happy with the product and would buy them again. 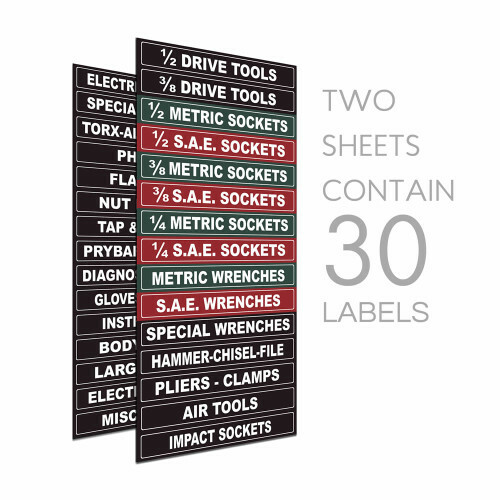 Label your wrenches and sockets…find the size very easily…. 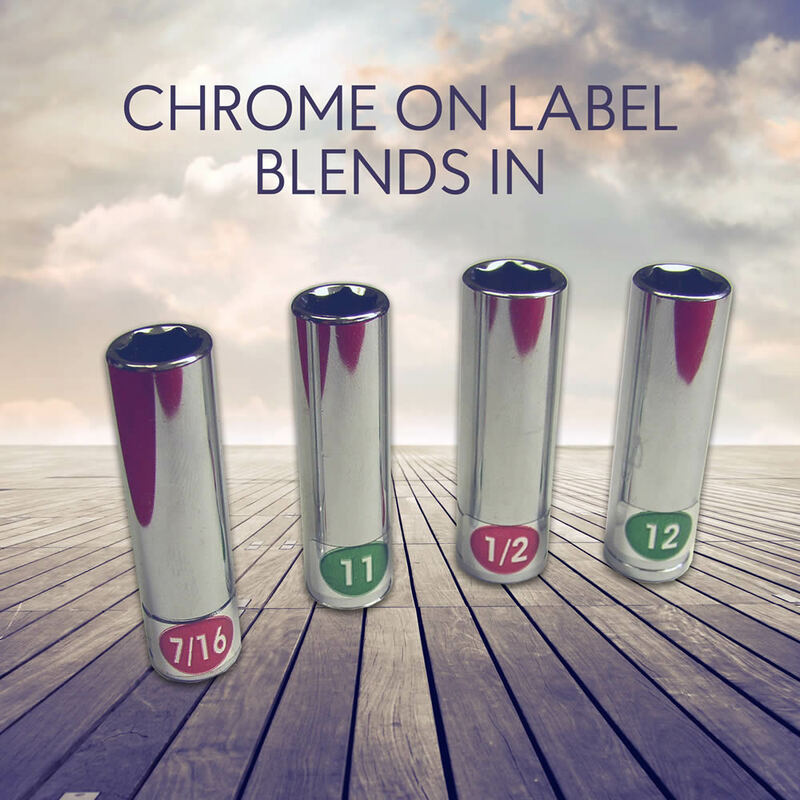 As your eyes begin to decline, and you can’t see those engravings on your sockets and wrenches….these labels make it easy to find the socket you are seeking. This was a gift for my husband. He has lots of sockets and he said that these would really help to make size selection much easier. These arrived promptly. This is a great addition to any tool set for the handyman who can’t see so well. 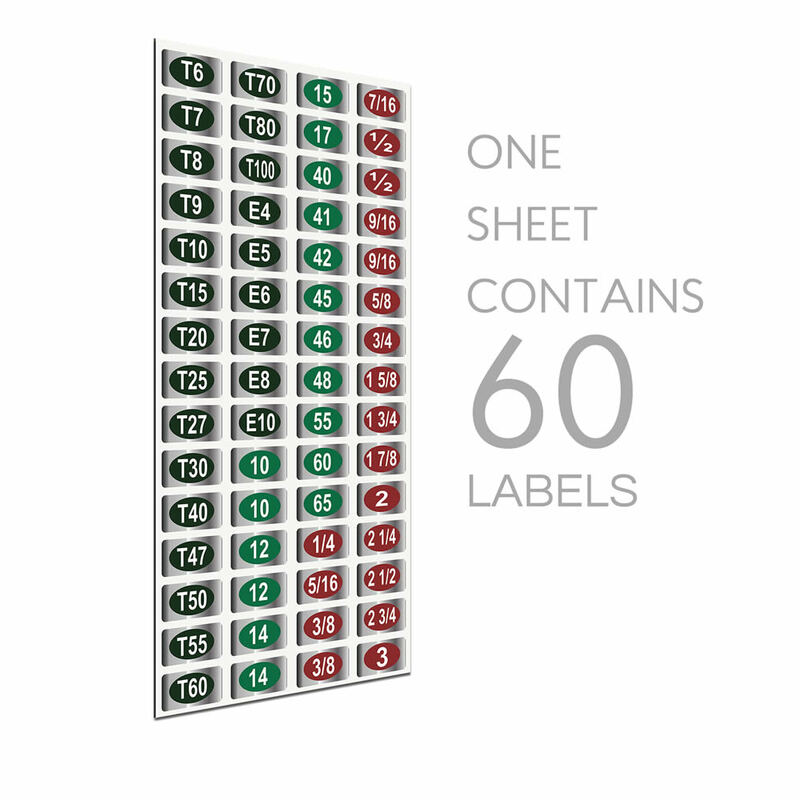 Very useful in low light with brightly colored labels. The product was out for shipping quickly. Would definitely purchase again as a gift. Very easy to see the size quickly. Stickers stays were you put them. Bought these for my husband and he likes them. I put them on his sockets and wow they make a difference you dont have to strain to see the socket size. Excellent for these tired eyes!! Great product that works awesome. I bought these to add on my impact sockets for work. (I work in an underground coal mines.) These adhere very well, and won’t peel under normal circumstances, but in my case, some sockets see frequent friction to the sides where the stickers are placed, and those have peeled. For normal duty, these would be unparalleled, but my situation is somewhat extreme. 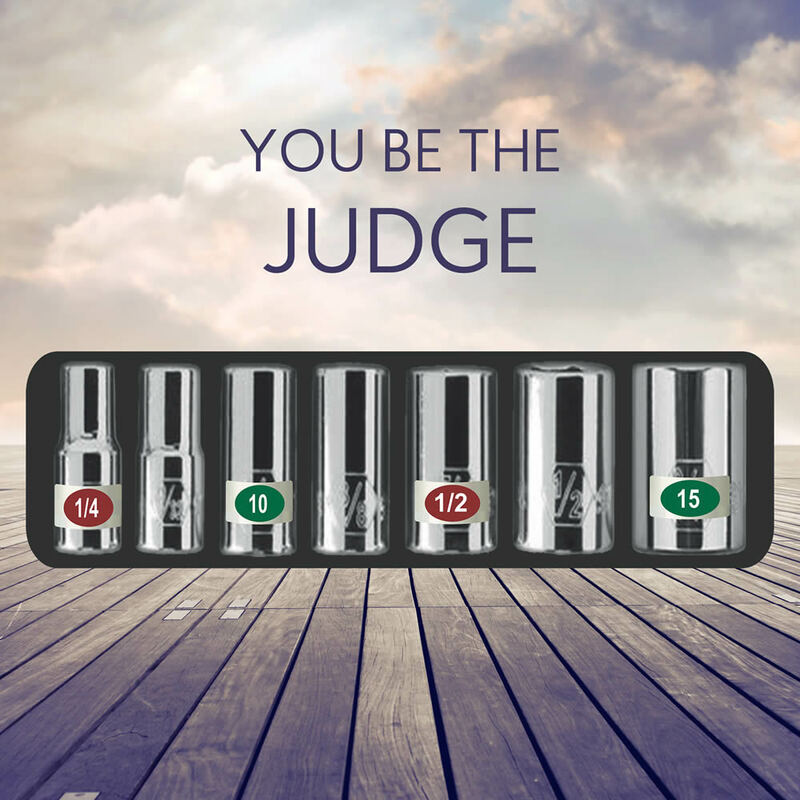 These are great for older eyes or in dim light. Grab the right socket the first time. These seem to stick well and are very easy on my old eyes. These are wonderful! My husband has so many sockets, and even with them being very organized, these decals make it fast and easy to find the right ones. They don’t work well for the really small sizes which have the sides that are slanted in, but for 99% of the other sockets, these work great. They attach to the metal well (if you clean with alcohol first). Our order was lost in the mail and I contacted the company and they shipped another quickly. GREAT Customer Service. I have recommended these to all my brothers and father and father in law. Amazing find, and well worth investing in. I bought 3 sets because my husband has various lengths of all sockets. You can download a PDF of our retail catalog to print and enjoy away from the computer.